The control of hard to kill and highly invasive weeds such as Parramatta grass, tussocks and fireweed has just become a lot easier with the release of the Winged Eliminator weed wiper from C-Dax. The Winged Eliminator has been developed based on farmers demand for a larger wiper with the capability of working on even the most undulating properties. The Winged Eliminator is 4.3 m in width and incorporates pivoting end wings. The end wings follow land contours to maintain the correct wiping height. 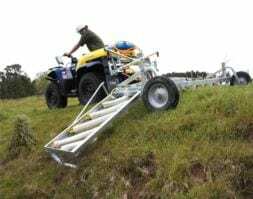 C-Dax spokesman John Hunt said that the Eliminator and Winged Eliminator incorporate a number of features ideal for controlling a range of noxious and declared weeds. “The C-Dax Eliminator applies herbicides such as glyphosate only onto the target weeds, avoiding pasture damage and the need for broadacre spraying” he said. “The wiping action of the unit avoids any risk of drift so windy days no longer become a limiting factor to controlling weeds on time” added Mr Hunt. An integrated electronic controller supplied with the Eliminator gives the operator the ability to precisely meter the output of the wiper relative to the level of weed infestation and pressurizes the system to supply an equal amount of chemical to both sides of the wiper, irrespective of the angle of operation.